Would you like to feel Rejuvenated? Youthful? Pain Free? Energetic? Then come explore what an Ionic Foot Detox could do for you! What is an ionic foot detox? 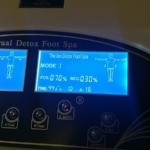 An ionic foot detox machine is a modern energy therapy device which balances the body’s natural energy system. By introducing a high level of negative ions into the water of a foot bath, the feet, utilizing principles of reflexology and the science of ionization and osmosis, create a positive cellular environment and enable the body’s natural detoxification processes to function at their peak. Your scheduled appointment time is reserved especially for you. If you are late for your appointment, your session time will not be adjusted in order to allow us to maintain all of our clients scheduling needs. If you are not going to be able to make your appointment, please give us a 48 hour notice. If you are unable to do so, there will be a charge of 1/2 of the total amount of your session cost. If the service plan you are interested in is not displayed, please contact our office for additional pricing options. Payment is due at the time of your session and late cancellation fees apply. This product is not intended to diagnose, treat, cure, or prevent disease. We make no medical claims and makes no statements of validation. Always consult with your professional health care provider before beginning any health care regimen. Copyright 2017 Agape Holistic Center - A Private Membership/ Copyright 2014 Biofeedback and Light Therapy,LLC DISCLAIMER: I understand that the Agape Holistic Center staff are not licensed physicians, chiropractor, or psychologist and do not portray themselves as such. They can not and will not diagnose, treat, cure, heal, evaluate, or prevent any medical or psychological disorder or disease. I further understand they will not advise, recommend, suggest or counsel me on any medical, dietary, or psychological treatment, condition, disorder or disease. I further understand it is my responsibility to continue my medications and remain under the care of my primary physician.